On the auspicious 60th anniversary of WWII, East Meets West, April 25, 1945, veterans of American and Soviet Units gathered in Germany, some as guests, others on a special guided 69th Infantry Division/American Express Tour, to celebrate the momentious event which signaled the end of the war in Europe, May 9, 1945, known as VE Day. The City of Torgau, Germany, played host to Joe Lipsius, Norcross, GA, suburb of Atlanta, Headquarters 272nd Infantry Regiment, 69th Infantry Division, WWII, and Edgar A. "Bud" Parsons, Chapel Hill, NC, Company A 272nd Infantry Regiment, 69th Infantry Division, April 23 -26, during their stay for its Elbe Day Festivities. On their arrival to Leipzig, Germany, Joe and "Bud" were met at the airport by Miss Eleanore Fox of The U. S. Embassy, Leipzig, Germany The Embassy was host to Joe and "Bud" for April 21-22, in Leipzig. After departing Torgau, April 26, Stefan Eggerdinger and Heinz Klee, of the "The Heaveny Four," entertained Joe and "Bud" in Berlin,Germany, April 27-28. Their airfare for the trip to Germany was assumed by The City of Torgau. Joe Lipsius is founder and Webmaster of this 69th Infantry Division Website. He was instrumental in obtaining American soldier's uniform articles, WWII maps, photographs, a 272nd Infantry Regimental history, and other artifacts, as well as copy of a U S Army Signal Corps film on DVD which shows 69th Division combat action for use by the Leipzig and Torgau Museums. "Bud" Parsons was one of four 69ers who raised money for, and took part in, the design and construction of the Torgau Memorial and Strehla Memorial Park, both on the beautful plains of the Elbe River. These Memorials are lasting tribute to the East Meets West Linkup. From Soviet Russia, Aliaksandr Silvashka, Leonid Volodarskiy, Grigory Prokopyev, Georgy Kuzuetsov and Ivan Shport were guests of The City of Torgau. 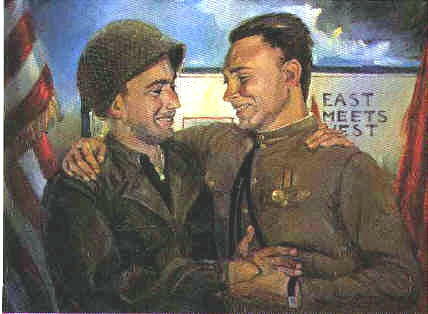 These former American and Russian soldiers took part in The Elbe Day festivities in the City of Torgau and Strehla, April 23-25, 2005, celebrating the 60th Anniversary of the East Meets West Linkup! A forty person group from the United States, members of the 69th, wives, second generations, relatives and friends, were in Weissenfels, Leipzig and Torgau, and elsewhere in Europe, on the special guided American Express European Tour to be in the Torgau Festivities. The Torgau festivities marked the 60th Anniversary of elements from the 69th Infantry Division making first allied contact with patrols from the Russian 58th Guards Division, at three different places, April 25, 1945, on or near the Elbe River, sealing the end of Nazi tyranny in Europe. Festive events tok place in Torgau from April 20 through April 25, 2005, with most of the townspeople taking part.